Daphne was a nymph from Greek mythology loved by both a mortal and a god, but wishing to remain chaste, she managed to escape the attentions of all for eternity. Daphne was a Naiad nymph, the daughter of either the river god Ladon from Arcadia, or Peneus of Thessaly (by the nymph Creusa). As with all the nymphs of Greek mythology, Daphne was very beautiful, but it was said that she had decided to remain untouched. The first to fall in love with Daphne was Leucippus the son of Oenomaus, the king of Pisa, and brother of Hippodamia. It was already known though that Daphne had decided to avoid the company of men, and in order to get close to Daphne, Leucippus disguised himself as a girl. Leucippus managed to get close to Daphne, and by accompanying her and the other huntresses in the chase, the two became friends; and of course, in certain circumstances, friendship can lead to more. Apollo looked upon the success that Leucippus was having with the beautiful Daphne and became jealous. Apollo managed to put the thought into the mind of Daphne and the other huntresses that it would be a good idea to cool off by bathing in the River Ladon. By the banks of the river and the women stripped off, but when Daphne and the others noticed the reticence of Leucippus to join them. Suspicious, Daphne and the other huntresses ripped the clothes off of Leucippus revealing that he was a man. Daphne was angry at the deception of her “friend”, and so she and the other huntresses plunged their weapons into Leucippus, killing him. The jealousy of Apollo against a mere mortal was said to have been caused by the actions of another Greek god, Eros. Apollo had been in a boastful mood when he had questioned why the youthful Eros had a bow, but never used it as a weapon. 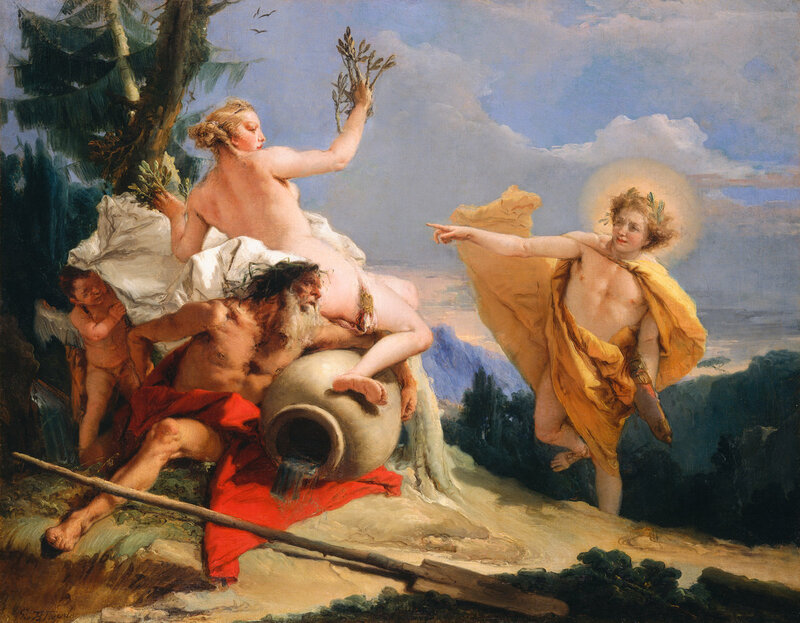 Eros would show Apollo the power of his bow and arrows, for he fired an arrow with the sharp point of gold at his fellow god, causing Apollo to fall in love with Daphne. At the same time, Eros shot Daphne with a blunt lead pointed arrow, causing Daphne to flee from the advances of Apollo. The power of Apollo was not sufficient to overcome the power of love, nor the power of indifference, caused by the arrows of Eros. Apollo would chase after Daphne, and wishing to escape from her pursuer she called out for help from either Gaia, Ladon or Zeus. One of these deities heard the request of Daphne, and the Naiad nymph was transformed into a laurel tree. His love might have disappeared, but Apollo would not totally forget his first love, for the laurel tree would become sacred to Apollo, and a wreath made from laurel would be awarded at the Pythian Games.